GALION –With more temperatures in the uppers 80s and maybe 90 forecast this week, AEP Ohio has offered some tips to help keep electric bills under control. 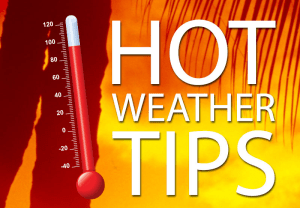 Hotter than usual weather in recent weeks means heavy use of air conditions and can result in higher electric bills. AEP Ohio has a program to help customers avoid seasonal bill increases — the Average Monthly Payment (AMP) plan. The plan spreads electric costs out over the whole year by basing monthly payments on a rolling 12-month average. Each month, the oldest bill is removed from the average and the current month’s bill is added. The result is a payment that might go up or down a few dollars but will remain relatively stable each month. AMP does not include a “settle-up” month, unlike the company’s Budget plan, which does. In addition to AMP, AEP Ohio offers a variety of energy efficiency programs to help customers save money and energy this summer, including a Home Energy Profile. This free, online service provides personalized recommendations based up a short survey about your home, appliances and energy use. When customers complete the profile, they receive a free energy efficiency kit by mail. Here are some other tips to help you further reduce electric usage. Turn off lights, fans and electronics when not in use. Replace incandescent light bulbs with Energy Star LEDs. Pull the plug on devices, like phone chargers, when not in use. They still consume energy, even when turned off. As a friendly reminder, unplugging your DVR/cable box might interrupt recordings of your favorite television shows and result in a full system reboot. Use smart power strips for electronics likes computers and televisions. They can sense when a device is turned off or not being used and will shut off the power automatically. Close window blinds to prevent the sun from increasing indoor temperatures. Keep the thermostat to a minimum of 78 degrees while circulating cool air with box and ceiling fans. Caulk, weather-strip and insulate windows and doors wherever air leaks are found. Replace air conditioner filters. Clean filters can lower air conditioner energy consumption up to 15 percent. AEP Ohio customers can enroll in AMP by calling the company’s 24-hour Customer Solutions Center at 800-672-2231 or by logging into their account and updating their billing preferences. AMP is only applicable to AEP Ohio charges. If you participate in Ohio Choice and want to enroll in a budget plan for generation charges, contact your generation provider. For more information and ways to save, visit AEPOhio.com/AMP.